The Portion Plate for adults. 100% melamine, 9 1/2" in diameter, dishwasher safe. The Portion Plate for adults. 100% melamine, 9 1/2" in diameter, dishwashersafe. 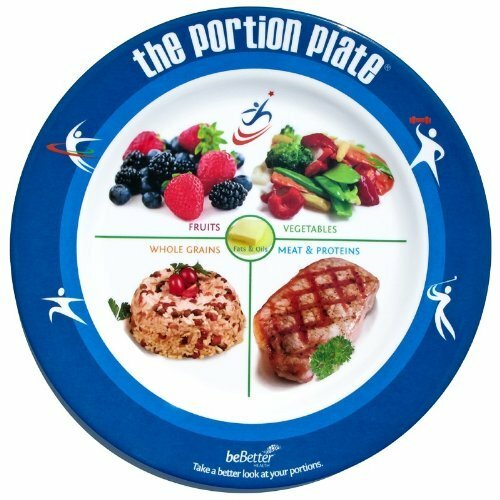 The Portion Plate is an interactive tool for teaching consumersappropriate food portions. Unlike a text-based paper educational brochure, ThePortion Plate is an actual melamine, dishwasher-safe plate that offers atangible demonstration of how much food we should eat. Not only are theplate's illustrated portion areas a good guide to follow, but the make up of agood meal is also presented. This means 1/2 of your plate should be fruits andvegetables, 1/4 of your plate whole grains and the remaining 1/4 lean protein.